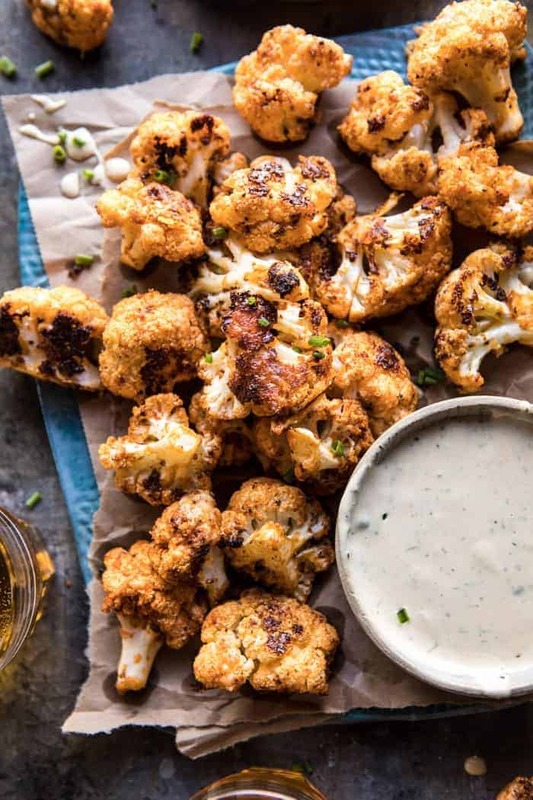 Meet the healthier, better tasting, Super Bowl appetizer, Spicy Cauliflower Cheese Bites with Tahini Ranch. It’s crazy that the Super Bowl is this Sunday. Most years I post a number of Super Bowl focused recipes, but this year it really just snuck up on me. I guess my focus has been much more on snowboarding, and the upcoming Olympics…and our big trip to Korea…than football. The good news is, I am finally sharing some game day recipes. 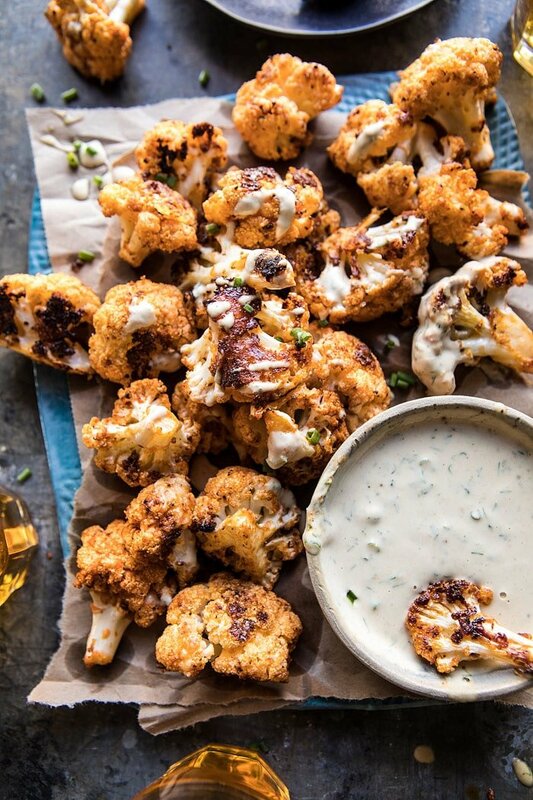 Enter these spicy cauliflower bites with tahini ranch…better than chicken wings, and with a much healthier ranch…honest. 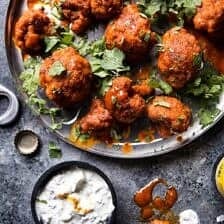 I’m not sure if I’ve mentioned this before, but back when I first started cooking, my family was obsessed with buffalo chicken, like homemade oven-baked buffalo chicken. I used to make it all the time. They still love it to this day, but you know, I needed to try something non-buffalo this year, and happily, I found these cauliflower bites to be just as good. They’re spicy, cheesy, and paired with a non mayo based ranch. Here’s how these go. 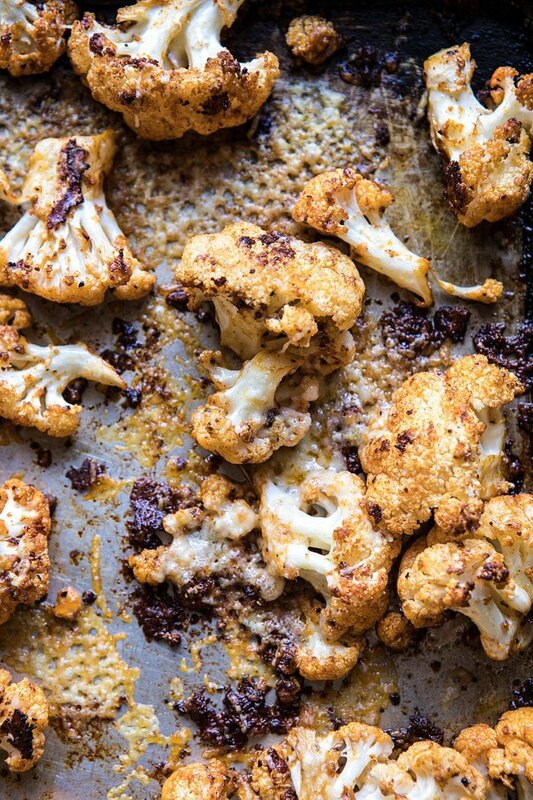 Start out by roasting the cauliflower. I like to add a little spice to the cauliflower by adding on some hot sauce. Next comes the cheese! The cheese is what make these bites similar to fried mac and cheese bites, but minus the frying and the macaroni. So not really the same at all, but the flavors and textures are there. I used a mix of parmesan and cheddar to get some really nice flavor. As the cauliflower roasts, the cheese melts and gets a little crispy towards the end, SO delicious. Think roasted cauliflower, but instead of it being boring, it’s fun with hints of spice, smoked paprika, and generous amounts of cheese. 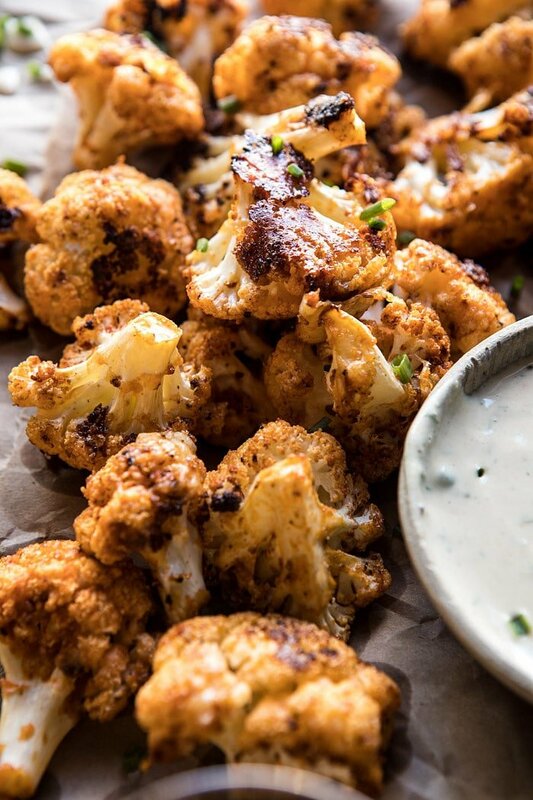 If you thought you didn’t like cauliflower, you will after making these bites. While the cauliflower is roasting in the oven, make the ranch. I’ve mentioned this before, but I really don’t like mayo or mayo based sauces. So most of the time I steer clear of ranch dressing. Over the last year or so, I have really loved swapping mayo for tahini, which is simply ground sesame seeds. It has the same creaminess, but better flavor. So that’s what I did with this ranch. The tahini replaces the mayo making this a dairy-free, gluten free ranch. Put it all together and you have the best healthy Super Bowl snack, easy appetizer, or side dish to serve at your next gathering. 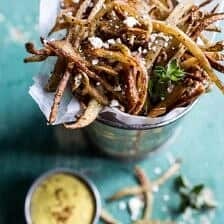 I love making these bites on Sunday and having them on hand to throw into big salads for easy lunches and dinners, or just to have around as an easy afternoon snack. They really are addicting. When I made these bites last week, I wasn’t sure how my family would react to them, I mean they are technically a vegetable. But when I sent a batch up to my parent’s house for the real taste test, everyone said they loved them. The great thing about these bites is that, contrary to the feeling you get after eating fried mac n’ cheese balls, or fried chicken wings, these bites are pretty much guiltless. I mean, sure there’s cheese, but you all know how I feel about cheese…everything in moderation. My one recommendation? If you’re making these for the Super Bowl this weekend, double the recipe. Trust me, these bites go fast. Better than chicken wings, and with a healthier ranch, the perfect little bites! 2. 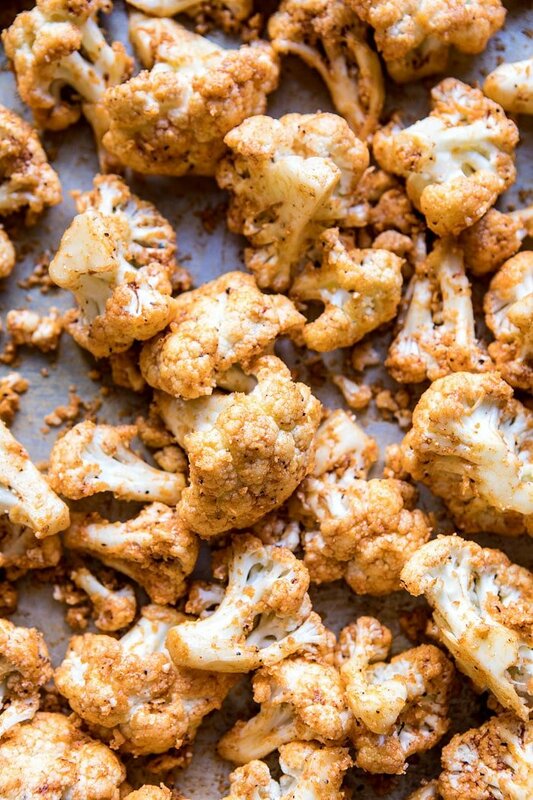 On a baking sheet, toss together the cauliflower, olive oil, hot sauce, paprika, cayenne, garlic powder, and a pinch each of salt and pepper. Add the parmesan and toss to coat. Transfer to the oven and roast for 15-20 minutes. Remove and add the cheddar. Return to the oven and continue cooking for another 10 minutes, until the cauliflower is golden and the cheese begins to crisp. 3. Meanwhile, make the ranch. Combine all ingredients in bowl. Add 1/4 cup water and whisk with a fork to combine, adding water if needed to thin. Taste and adjust seasonings. 4. 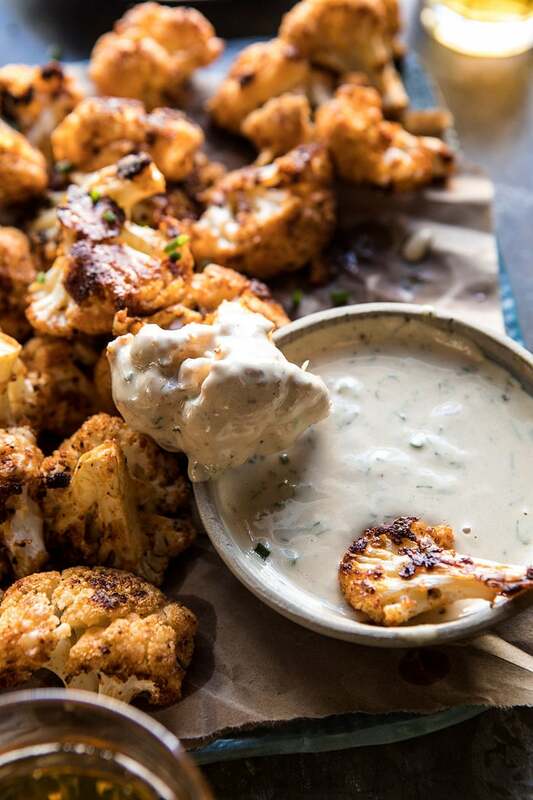 Serve the warm cauliflower bites with the tahini ranch. Enjoy! YES! I hope you love these Ruth! Thank you! Really looks tasty. I have always liked raw cauliflower but not so much cooked. However, these really look tempting. 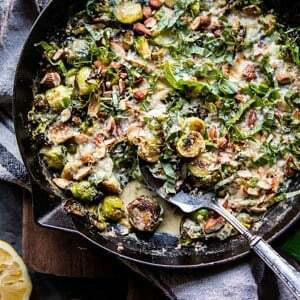 Oh my goodness, Superbowl totally snuck up on me too girl so I’m so excited for this delicious way to do cauli! I’m also obsessed with tahini so this was pretty much designed for me!!! Always looking for healthy appys for the Super Bowl Tieghan! These look like they’d fly right off the platter. totally trying this recipe! love!!! Thank you Caroline! I hope you love these! Oh YES. A perfect Superbowl snack! These look ridiculously addicting and so perfect for game day! Perfect Super Bowl party food!! I hope you’re enjoying your work trip. Are you in LA? How was your visit? I hope you’re doing ok and enjoying your time. this has to be the strangest “ranch” dip or drizzle I can imagine. Is it “ranch” because it has spices? Or is something missing?? If not, it’s just a tahini dip. The picture looks like ranch (it’s creamy white) How odd. 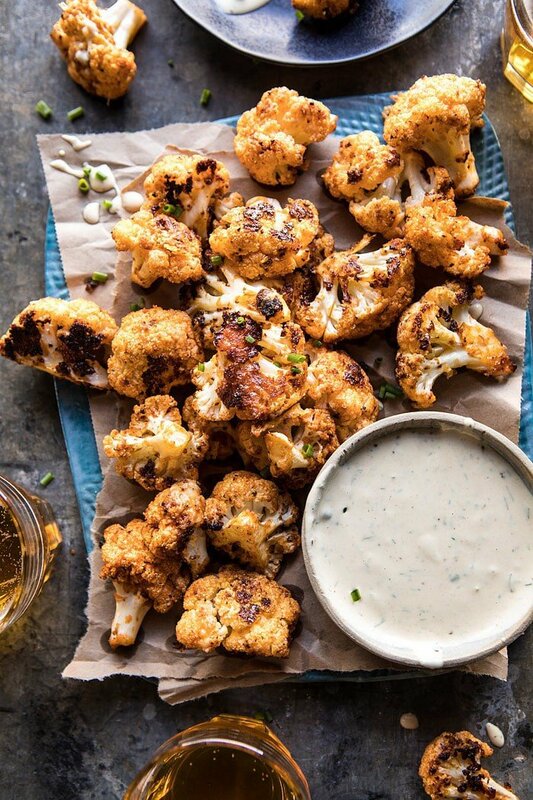 Roasted cauliflower is my fave and the tahini ranch sounds so good! Love this! I’m all about trying new ways to get my kids to eat veggies and this recipe definitely looks tonfit the bill. Cheese and ranch dip?? SOLD! Can’t wait to try this tomorrow! Oh man, these look fantastic! I’m iffy about cauliflower and cheese because of the texture, but these look crispy and perfect! Thank you so much Jessica! Glad you like these! I made the cauliflower bites last night for snacking during the Super Bowl. Everyone loved them. They are good eating without dipping in dressing. This recipe is delicious!!! Made both the cauliflower and the dip for Superbowl Sunday. The cauliflower had so much flavor, it was great as a stand-alone treat. And the Tahini Ranch was great with raw veges. Will definitely make this again. The only thing I changed was to mix the Parmesan cheese with half nutritional yeast and omitted the cheddar cheese – to accommodate dietary restrictions. Thank you Deb! I am so glad you liked this recipe! I hope your SuperBowl Sunday was amazing! We enjoyed these. I didn’t make the dressing as we used some dressing we had on hand, but followed cauliflower portion as printed. I used sriracha for the hot sauce. Thank you Lesley! Let me know how they turn out for you! SC is in a heat wave right now, but I really want to make these ASAP. How well do you think these would cook on the grill or in an air fryer? Thanks! AMAZING! I actually only had one head of cauliflower but kept the spice quantity the same and used Pico Pica hot sauce and ended up squeezing lemon juice on at the end. Next time, I would use sea salt because I think it brings out the lemon flavor. This was so good I ended up devouring the entire head of cauliflower and ate it for dinner! 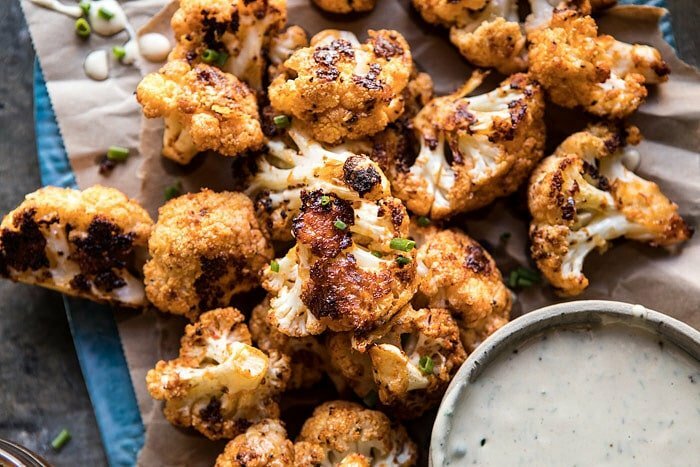 Thank you for this delicious take on cauliflower! 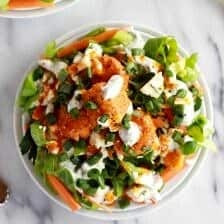 My plan was to pair this recipe with your other recipe of Sun Dried Tomato, White Bean and Goat Cheese Pasta Salad and a roasted chicken, but I ate the cauliflower to fast and and ended up doing the salad and chicken the next day, which was delicious! Thank you so much Asha! I am so glad you loved this recipe!! This recipe is to die for! I have probably made it ten times and it’s a hit every time! It tastes super decadent for a portion of the guilt. Thanks! Just finished eating this for dinner and I’m still in a gastronomic bliss. Seriously good and relatively guilt free. I substituted plain greek yogurt for the tahini, simply because I did not have tahini. Cannot wait to make this again! Thank you so much Heather! I am so glad you loved this recipe! Can I make these ahead? If so, do I simply reheat to serve? 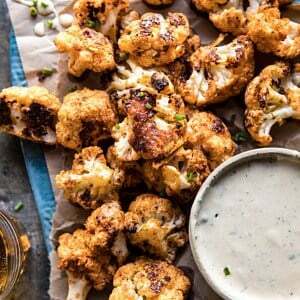 Tried this cauliflower bites recipe last night and my husband loved it. Says its a keeper. Thats all the praise you need. I am wanting to make these and not sure what Franks Sauce is? I am from Australia what would be a good substitue? I have Saracha in the Pantry? i am also wondering about serving on Creme Fraiche with lemon instead of the tahini.. I made this last night for a cocktail buffet and people loved it! I made a sour cream & chive dip + your tahini ranch, adding a couple of drops of honey to balance the bitterness of tahini. The cauliflower was all gone before the meat, yay!